I am a parent. I am also a teacher. I have a six year old boy in kindergarten this year. I have also worked, in some capacity, in classrooms for more than half of my life. And I am concerned. In a nation as diverse as ours, in cities and schools and classrooms full of families and children with their own stories and backgrounds and experiences, it is mind-boggling to me how little diversity is actually celebrated. (Note that I did not say “tolerated”; saying that we “tolerate diversity” is a microaggression that places anyone who does not fit the majority cultural norm neatly into the role of “other”.) As both a teacher and a parent, the current situation is sad, frustrating, and frightening. While I can think of a number of examples, here are two that I believe most clearly illustrate what I’m talking about. These are not cultural biases built into standardized tests or differences in funding; these are clear examples of diversity being stifled and diverse students being “othered”. As we enter into “the holiday season”, there is an amazing amount of cultural imposition going on within our schools. There is a major emphasis on Christian holidays. Even the classrooms that teach about winter holidays from different cultures are, most often, imbalanced toward a focus on Christmas. From books to writing activities to art projects displayed throughout the hallways to songs taught and sung, the focus is on Christmas and there are a few lessons dropped in here or there about those holidays that “other people” celebrate. Even if those words aren’t used, that’s the implication based on the number of instructional minutes dedicated to Christmas versus All the Other Winter Holidays. The last public school I worked in did a “Winter Holidays Around the World” unit. We were all required to do it. Most of our daily lessons were Christmas focused and we had a few lessons about Hanukkah, Kwanzaa (which isn’t even on the Wikipedia link above…), and Las Posadas. As a secular spiritualist, I don’t particularly celebrate any of the holidays. About half of the students I’m currently working with are from families who are Jehovah’s Witnesses; they don’t celebrate any of the holidays. What about the agnostics and the atheists who don’t celebrate holidays? I’m not saying that the cultural lessons of the season should be ignored or edited out of curricula around the country, but I think we all need to carefully examine the messages that are being sent to children and families whose customs are different. Lessons should be balanced, families should be encouraged to participate in guiding the lessons so that they can (at least) represent the backgrounds of those present, and while they can (and should) be included in learning I strongly believe that holidays should not take over the curriculum during winter. 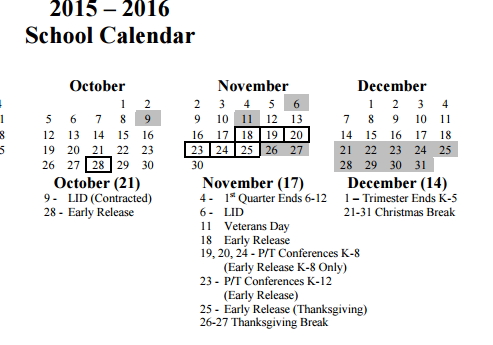 Honestly, I can’t believe that our school district’s calendar says “Christmas Break” and not “Winter Break”. My son is in a class of 20 students. In his class there are speakers of Spanish, Russian, Japanese, English, and Punjabi. There are almost 600 students enrolled in the entire school. Just that one word on the calendar makes me, a non-Christian, feel like the diversity of the school is barely tolerated and certainly not being celebrated. How does it make the students feel, the ones who don’t celebrate Christmas or any holiday? My kid is busy. He likes to move around. He’s a kinesthetic learner, as are about 37% of all students in elementary and secondary schools (Miller, 2001). He is just as squirmy as most of the kindergartners I’ve ever known (which now numbers in the several hundred). And he’s now being given “accomodations” because his need for movement is, according to the administration and teacher, a distraction. They fail to see that being told to sit still, criss-cross applesauce, hands in your lap, eyes on me is, for him, a distraction from his own learning. And he’s not alone. A few years later, I had another very intelligent little boy in my class. He also had some challenging behaviors, one being a refusal to write. No matter what materials I gave him, he would not write. He would sit with his head down and wait. Until we were making maps with toy cars on the carpet and constructing the buildings in our neighborhood with Popsicle sticks. He made the coolest structure and he was completely engaged for the first time all year and he asked me if he could bring a paper and pencil to the carpet to write about his building. He lay down on the floor and began to write. We worked it out that as long as he was working, I had no problem with him going to the carpet. We worked it out that the rest of the class saw this as what he needed to learn and not all of us need the same things. (A few kids tried it, but most of them discovered that they worked better at a table.) And then, again, my administrators came through, different administrators, and said the same thing: He could not work that way, even though it was what he needed to be successful, because he wouldn’t be allowed to do it when he got older? And, being me, my answer was the same: WHY NOT?! Adults are allowed to work sitting on exercise balls, at standing desks, in ergonomic posture chairs, in jobs that do no require sitting at all…so why are we imposing this belief that “real learning” must take place by sitting a certain way even if the evidence indicates otherwise? Why are kids who need to move, or look outside, or lie down being singled out and made to feel different because they don’t fit the mold? And how many kids would do better if they knew they had options rather than being made to feel like a problem for asking for something different? There are so many things in our schools that I could call out as examples (don’t get me started on the boy/girl dichotomy…). There are so many practices firmly entrenched in our education system that teach one loud, booming lesson: If you are different, you are a problem. Both of the boys I mentioned were later referred to Special Education because their learning needs didn’t conform; I’m worried that my kiddo is going to be referred. We can change this system with patience, compassion, and effort. We can return to child-centered learning instead of corporate-sponsored, test-driven education by giving highly-qualified, well-educated teachers the autonomy to make decisions about their classroom environments. We can support teachers by ensuring that administrators are updated on current best practices (my first administrators were decades out of the classroom and my second set came from secondary education backgrounds). We can promote real, honest reflective teaching by seeing our students’ failures as our failure to provide what they needed to be successful. We can truly embrace and celebrate the diversity of our classrooms instead of “tolerating” students and families who are diverse by creating strong school/family partnerships. Miller, P. (2001). Learning styles: The multimedia of the mind. ED 451340.